Costa neoRomantica is the jewel of the fleet! The results of an innovative total restyling project that transformed Costa Romantica. Costa neoRomantica is designed as a 5-star resort. Its refined and sophisticated environments, prestigious and elegant, will seduce you at first glance. Designed to amaze, it will create a unique atmosphere and uncover new emotions. The new Costa neoRomantica will impress you with the contemporary, sophisticated and luminous design that features in every room. Fine materials, hi-tech solutions and cosy environments inspire romance and relaxation, either with your partner or with friends. Costa neoRomantica offers the most picturesque Samsara Spa of the fleet. Intimate environments, restful colours and soft lighting convey an unparalleled sense of relaxation. Pastel colours, subdued lighting and precious materials: all designed in the finest detail to encourage total relaxation. Enjoy the spacious areas of total comfort and the large windows with spectacular views of the interior. 7 night cruise sailing from Kobe aboard the Costa neoRomantica. 6 night cruise sailing from Osaka aboard the Costa neoRomantica. 15 night cruise sailing from Tokyo aboard the Costa neoRomantica. 16 night cruise sailing from Tokyo aboard the Costa neoRomantica. 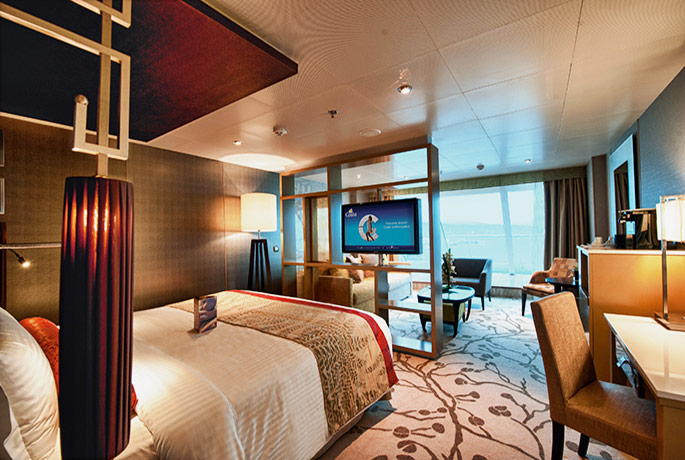 8 night cruise sailing from Tokyo aboard the Costa neoRomantica. 8 night cruise sailing from Kobe aboard the Costa neoRomantica. 8 night cruise sailing from Tokyo (Yokohama) aboard the Costa neoRomantica. Window and private balcony with sea view. Air-conditioning. Flat LCD satellite TV. WiFi (service with extra charge). Minibar and Room Service (service with extra charge). Hairdryer. Safe. Samsara Restaurant with dedicated Maître D'. Option to make a dinner reservation for the restaurant. Welcome Ritual (includes a selection of wellness treatments and fitness lessons). Free continental breakfast in your cabin, on request. Access to the Spa. Wellness shower filter. Aroma diffuser, Scales. Minibar (service with extra charge). Free 24-hour room service. Tea kettle and tea cups with selection of ayurvedic tea filters. Bathrobes, towels, slippers, sheets and pillowcases made from organic cotton. Air-conditioning. Flat LCD satellite TV. WiFi (service with extra charge). Minibar and Room Service (service with extra charge). Hairdryer. Safe. Window. Air-conditioning. Flat LCD satellite TV. WiFi (service with extra charge). Minibar and Room Service (service with extra charge). Hairdryer. Safe. Balcony with panoramic view. Priority boarding. Butler (except Minisuite). Invitation for an exclusive cocktail with the Captain. Option to make a dinner reservation for the restaurant. Fresh fruit every day, 1 bottle of spumante. Free continental breakfast in your cabin, on request. Choice of the best pillow to rest your head. Jacuzzi with towelling bathrobe and slippers (except Minisuite). Kit of bath product. Flat LCD satellite TV. WiFi and Minibar (service with extra charge). Air-conditioning. Free 24-hour room service. Hairdryer. Safe.